Managing German Shepherd Puppy growth is a very important part of owning a GSD. That loveable little bundle of joy, your German Shepherd puppy, is a growing machine. If you've never raised a German Shepherd puppy before, you'll find out soon enough that that eight pound ball of fur you just brought home will eventually weigh around a hundred pounds or so. And if you have owned German Shepherds before you already know about the incredible rate of growth that these dogs go through - but maybe you need a refresher course. Either way, let's take a few minutes to cover the finer points of managing German Shepherd Puppy growth. As German Shepherd puppies grow they sometimes need as much as two to three times more energy and nutrients per pound of body weight than that of an adult German Shepherd. Even more importantly, optimal nutrition is key for the development of strong bones and teeth, clear eyes and healthy coat and proper physical development. Managing German Shepherd Puppy growth is very important. Based on a a German Shepherds size and family background, caloric requirements of German Shepherd puppies gradually decrease to adult requirements as the puppy matures but this does take time. Managing German Shepherd Puppy Growth for example, in these Large breed puppies, require fewer calories per unit of body weight and mature at a much slower rate than typical smaller breed puppies such as a Yorkie or Pug. It is important to understand that while rapid physical growth occurs during the first few months of life in all dog breeds that it is also prolonged in the case of large and giant breeds. Remember, these larger breeds take a long time to develop and mature as compared to a smaller dog breed like a Chihuahua. Because of this one simple fact it is very important to reduce a large dog breeds' caloric intake as a puppy in order to help it grow safely. No GSD puppy needs to be overly chunky as it grows up. A little chubbyness is normal but as you puppy grows up it should also slim down. Whenever feeding your German Shepherd puppy, avoid overfeeding it - this will help the Alsatian puppies actual development. Excess weight in a developing GSD puppy puts extra stress on its developing skeletal system. The musculoskeletal system of a young dog is in a constant state of change throughout its life, however the highest rate of turnover happens during growth, especially during the first few months of life. This rate of change will slow down as maturity nears but for large or giant dog breeds it may take up to two years or longer for the puppy to reach its true adult size. Excessive caloric intake can easily contribute to an accelerated growth rate as well as excessive weight gain. And you don't want that in a developing German Shepherd puppy. 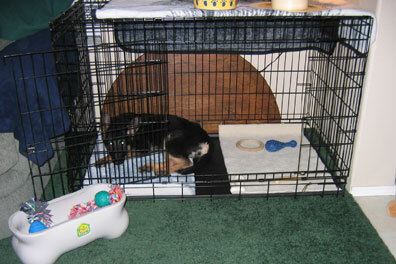 You want to keep the puppy in ideal body condition as they mature throughout the entire process. All Alsatian puppies should be maintained in ideal body condition which means that they should maintain an hourglass shape when viewed from above, with a definite waist behind their ribs. If your puppy starts to put on extra pounds then reduce their calorie intake by reducing the amount of food that they are fed. Remember, you do not want your German Shepherd puppy to get too "heavy". Other tips for managing German Shepherd Puppy growth include feeding for proper health as well. Proper nutrition is so important for that developing puppies body - that can't be overemphasized. It is also very important that you don't transition the puppy to an adult maintenance diet too soon. The best advice I can give you is to avoid overfeeding German Shepherd puppies all together. Doing so avoids excessive weight gain and helps manage puppy growth which is truly beneficial to the skeletal development of large breed puppies. Foods that are specifically formulated for large breed puppies help provide both reduced levels of fat as well as calories which help slow a puppy's rate of growth. It's important to understand that the protein requirements of all growing puppies are higher than needed for adult dogs. For puppies, diet should contain more than 25 percent protein. Other things to take into consideration are minerals, amino acids, calcium, potassium, magnesium, copper and zinc. Calcium is needed for healthy bone development and absorption of other minerals. Avoid overfeeding, do not allow your puppy to free feed, add dietary supplementation as needed, feed a complete-and-balanced diet for large breed puppies with highly digestible protein and carbohydrate sources. Remembering that diet is key in the proper development of a GSD puppy is important. Take all these suggestions above into consideration and act on them and your German Shepherd puppy should easily mature into a wonderful, healthy and happy adult. Good luck.